There had been a sale on avocados and I bought a bunch of them for my avocado loving family. I went on a search for avocado recipes and I ran across this unique guacamole. I knew that between the bacon and the roasted garlic (yum!) if there was ever a chance of my liking guacamole, this was the recipe to try. That was an excellent decision. Yes, I made guacamole and I LOVED it. There is a long-running joke in my family that I won’t touch guacamole. To tell the truth, I just might have had nicknames for the nasty green goop when I have been offered it in the past. It had been years since I even tasted it. Maybe my taste buds have finally grown up. I was on the phone with my sister while I was making this guacamole. She burst out laughing when I told her what I was doing. She asked if I was planning to taste it and when I told her I already liked it, she couldn’t believe it. When I texted her the next day to tell her that I’d polished it off and eaten a ridiculous amount of it for lunch, she was as shocked as I was. This guacamole really is THAT good. It’s been three years since we first tried this recipe and it is still the guacamole that converts haters to fans. 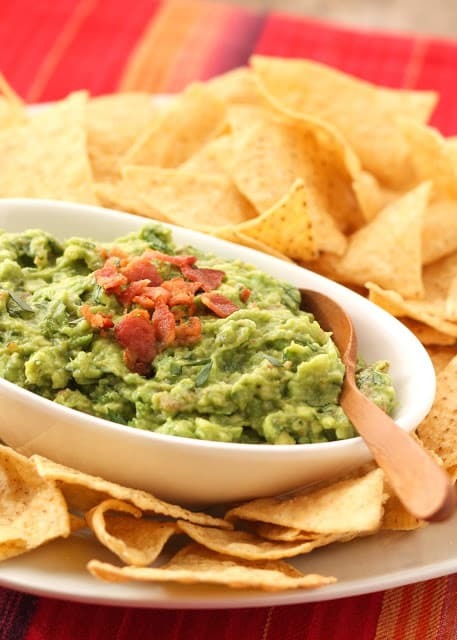 If you already like guacamole (unless you hate bacon – is that possible? ), you are certain to love this twist on the classic. If you aren’t a fan now, this just might be the recipe to convert you too. Craving bacon now? I recommend making some Bacon Cream Cheese Bites with any bacon you might have “leftover.” (Is there really EVER leftover bacon in the house?) Be warned though, these are going to disappear just as fast as you can make them. Kitchen Tip: I use this bowl, this masher, and this spatula to make this recipe. Preheat oven to 450 degrees. Slice off the top of the garlic head and place it in the center of a piece of foil. Drizzle with oil and wrap the foil around it. Roast for about 45 - 60 minutes, until the garlic is soft and squishy when you squeeze it gently through the foil. Remove from the oven, unwrap and let cool. While the garlic is roasting, start cooking the bacon on the stove. When the bacon is almost done, add the onion and cook over medium heat for about 2-3 minutes, until it is tender. Remove from the heat and set aside. Place the avocados in a bowl with the roasted garlic cloves (they should easily squeeze out of the head of garlic) and mash the mixture with a fork or potato masher. Add the lime juice and the cayenne and mash the mixture until it is the consistency you like. I preferred it with some small chunks still remaining. Stir in the onion and the bacon. Taste and add salt as needed, 1/4 teaspoon worked for me. Enjoy! If you won't be using it right away, you can toss the roasted garlic it in the refrigerator until you are ready to use it. I just squeeze the soft cloves out of the head of garlic. You can also use the tines on a fork to pull them out. Then transfer to an airtight container and refrigerate until ready to use. I like avocado when there is some acidity added. 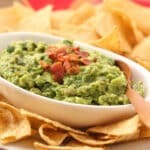 Your guacamole would be loved here, especially because you added garlic, bacon and lemon for a extra flavor dimension. Oh my! 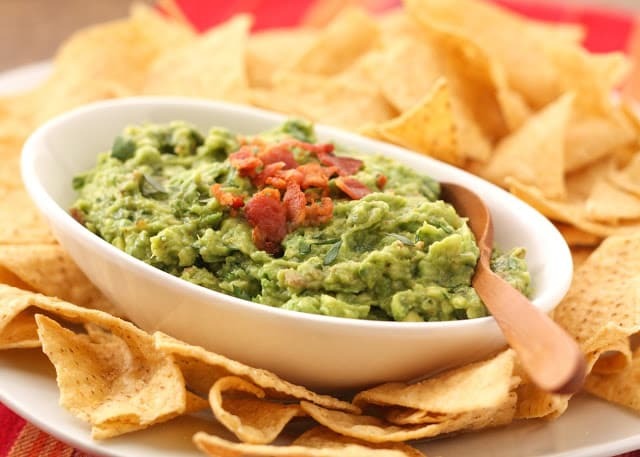 Now this sounds interesting, we adore guacamole in our family and normally I'd be a bit scared to mess with the recipe but this one I've got to try- thanks! Oh wow, now this looks interesting, and inspiring! We adore guacamole in our family, and normally I'd was scared to touch the recipe- but this one I've just GOT to try. It sounds amazing! They do say that tastes and aversions change every few years so maybe this was just your time! So glad you like guac now! It's one of my favorite spreads. Looks like a great recipe! Very cool, that you enjoyed it too. Great idea of the roasted garlic, however, the cooked onions, I guess I'm a traditionalist when it comes to this. I love guacamole, so I know that this must be a winner! It is amazing how our food preferences change though. I have found this especially true during pregnancy! Thank you so much for sharing, my friend! We are big guac fans and just the title of this version made me hungry then your shots put me over the top. I love guacamole, but never would have thought of adding bacon. I'm sure I would love this version, too, though, because - bacon! :) I am excited to try it.